The SunTree Team’s Property Management Program provides services for areas in Chandler, Gilbert and Queen Creek. Our office is conveniently located on Arizona Avenue, between Ocotillo and Chandler Heights in Chandler, Arizona. In addition to our aggressive advertising program, we offer an owner’s management agreement which may include maintenance, inspections and cleaning services. We manage both furnished and unfurnished properties available for long-term or short-term lease. We offer an established winter rental clientele for the furnished rental properties we manage. The previous years’ tenants leave an application for the upcoming year upon vacating the rental property. We maintain an above-average occupancy rating with the furnished homes we manage. We’ve noted many of our repeat clientele are arriving earlier and staying later every year which is attributed to our excellent custom service, overall rental experience and knowledge of the property management field. The SunTree Team also has a consistent tenant clientele seeking to lease long-term (six to twelve months) unfurnished rental units. SunTree has great success with keeping long-term, unfurnished homes leased. Many of our tenants choose to extend their contract after their lease has expired. If you have an unfurnished home you would like to lease, we will gladly meet with you to provide a Comprehensive Market Analysis, which will aid you with setting your rental rate at a marketable level. 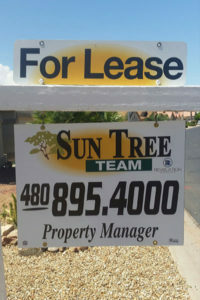 As part of our aggressive advertising program, your property will host the eye catching and well know SunTree Team “For Lease” sign to appeal to prospective tenants. However, please note that some HOA’s don’t permit “For Lease” signs in certain communities. To have a Property Management associate contact you to talk about leasing your home, please call us at (480) 215-8565 or complete the following form.